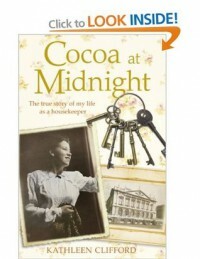 The Inside Story of "Downstairs"
Cocoa at Midnight, which I won as a Goodreads giveaway, is the true story of Kathleen Clifford's life "in service" in mid-twentieth century Great Britain. It is part of the series The Life of Servants. Written in Ms. Clifford's own voice, her memoir of the "downstairs" life sheds light on the strange institution that was British domestic service, a real-life look at what we've seen on "Upstairs, Downstairs" and "Downton Abbey." Ms. Clifford shares her childhood poverty in Paddington, West London, and her early realization, as a young teenager, that the only way out for her was to enter service and make her way up the very long ladder from lowly maid to the highest female service rank of housekeeper. She regales us with the unusual habits of her employers, letting us in on secrets that only someone who was there could know. This is an easy read, written in a colloquial style. 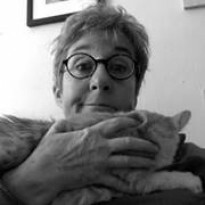 One feels like one is having a conversation with Ms. Clifford about her life, and I am grateful to have "met" her and discovered the ins-and-outs of the institution of British service and absolute oddities of the British upper class.